Volumes 2, 3, 4 – covers biographies of Australasian Clumbers featuring a photo, 4 generation pedigree, details of major achievements. Plus updates, kennel reviews and media clippings. 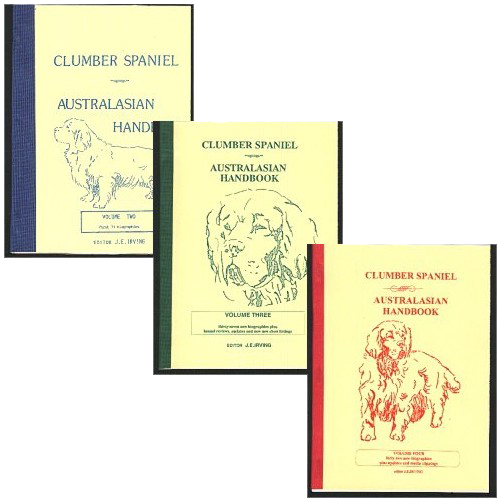 is NOT included, it is out of print, it covered health, care, and history and Clumber Spaniels published by Hoflin covers the bulk of this material plus much more. one of a series, volume 4 contains 42 new biographies of Australasian Clumbers featuring a photo, 4 generation pedigree, details of major achievements. Plus updates and media clippings.